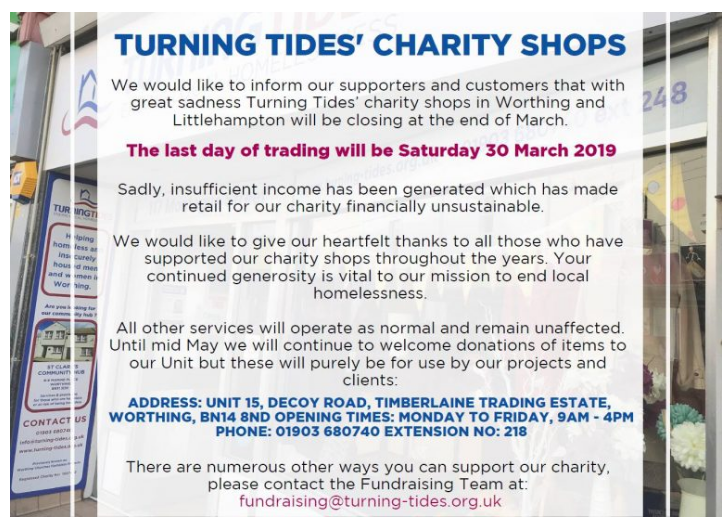 Amazing how only months after massive spending to re-brand (Worthing Churches Homeless Projects rebrands as Turning Tides) Turning Tides decides to close its Charity Shops due to “insufficient income generated” (shops which had been subject to a costly re-brand). Charity Shops are an excellent way to promote your charity, and to give volunteering opportunities for clients and members of the community. They allow for direct engagement and should, if managed correctly, be financially viable (it’s not all about making profits Mr Holmstrom). Mr Holmstrom seems to have a general dislike for charitable endeavours when weighed up against profit. Having previously closed the charity’s Durrington shop, that was not only profit making, but trained clients to be bicycle mechanics and supplied the local community with cheap bikes and great servicing. In my opinion this is a further erosion of the charity, and another move to be a profit generating housing provider rather than a valuable service to the community. If you have read the blog you will know that the initial focus was around the unfair dismissal of Jacqui M, former Housing Manager for WCHP (Turning Tides) and how people lied to ensure she was dismissed. Something turned up today that might be of interest to anyone who currently works with Paulina Dyrda (former employee of WCHP). 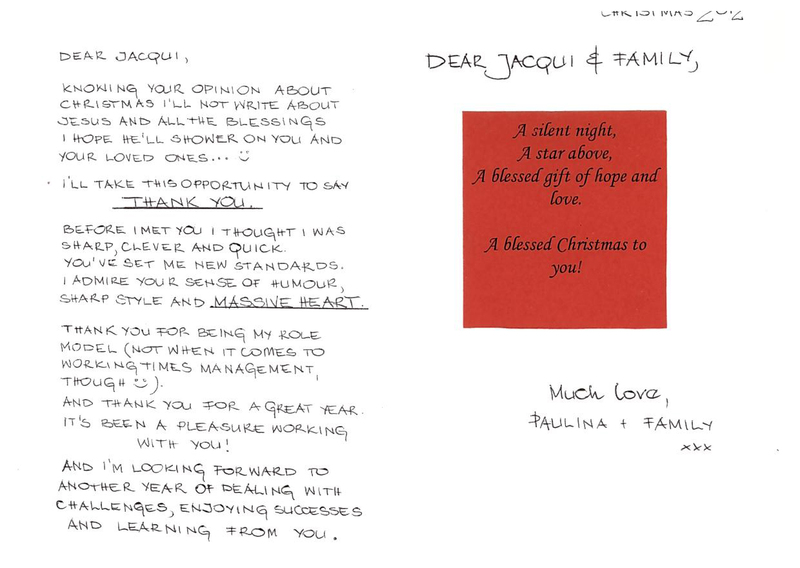 In addition to allegations regarding Jacqui M’s treatment of clients and other members of staff, Paulina’s signed statement claimed that she had wanted to leave since the day she started due to treatment of her by Jacqui M. That Jacqui M had racially abused her, bullied her, stopped her from doing her job, never given her any responsibility and caused her depression and had a severe impact on her family (along with several other pages of libel). 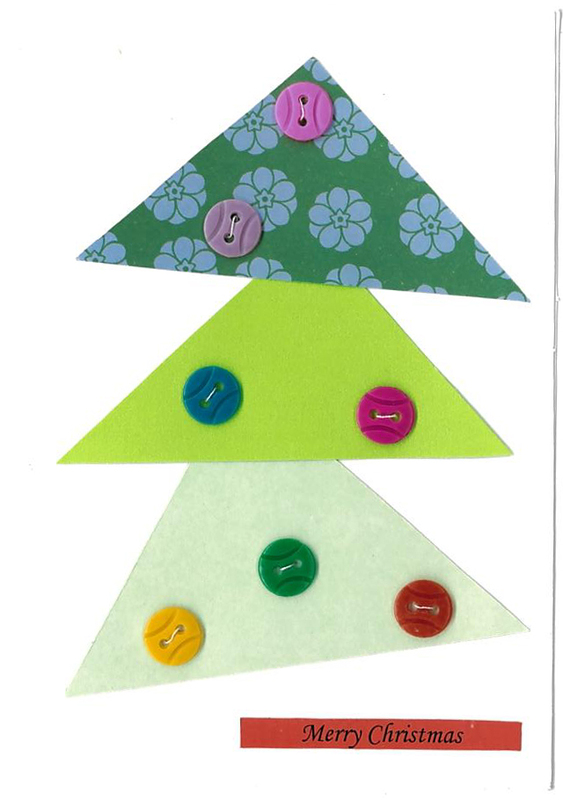 In addition to the emails from Paulina to Jacqui (post here) showing this to not be the case, below is a beautiful hand made Christmas card from by Paulina for Jacqui. This must have taken a lot of time and effort, not generally something you do for someone who has treated you in that way. In my opinion, this should act as a warning to anyone who works with this person as to how much you should trust them. For people who consider this to be “old news”, my concern is that all the people involved are still working closely with some of the most vulnerable people in UK society. To John Holmstrom and Turning Tides / WCHP, this is what a real CEO who cares about the homeless has to say. I hope you are suitably ashamed. Anyone who has ever been involved in a re-branding exercise will know that it is time-consuming and expensive. At a time when housing funding cuts are threatened throughout West Sussex I would think that potentially effected organisations would be thinking twice about any unnecessary expenditure. 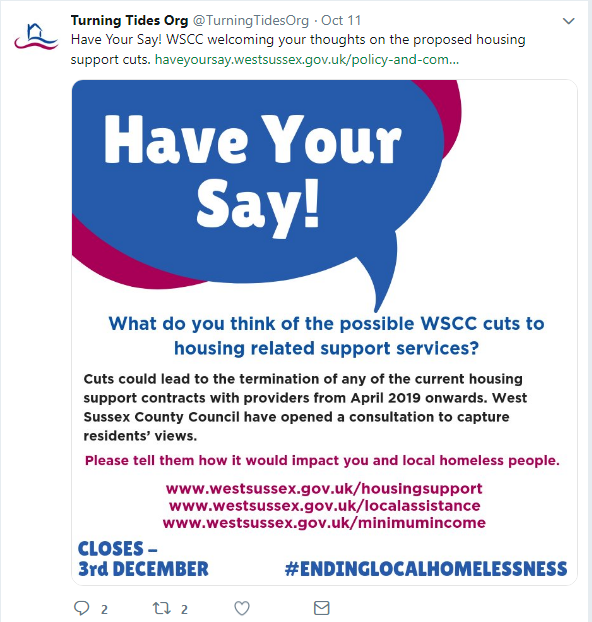 As we can see from WCHP’s (sorry, Turning Tides) twitter post their services could be threatened by these cuts. What better time to re-brand? Personally I would consider it to an inappropriate use of funding at any time, unless secured expressly for this purpose. However, in the current financial climate I suggest that this is a gross misuse of funding that could have been used to actually help homeless people. I would prefer it if WSCC gave my taxes to organisation who prioritise supporting those in need, rather than some new logo’s and stationary. I have had no response from WCHP / Turning Tides with requests as to how much they spent on the re-branding, which leads me to assume that it’s something they feel they can’t justify? Or even a comment on how they could justify any expenditure that may impact homelessness provision at this time. I do note that Sue Stevens “PR and fundraising manager, has been with the charity for more than 12 years.” hopes that is will “encourage potential clients to approach us” (Argus ). I would suggest that being homeless should be encouragement enough. However, I’m sure having a new logo will help. I also feel that this is yet more justification to allow the public to make FOI (Freedom of Information) requests to Charities. At the bottom of this post you’ll find a generic list of things that need to be considered when re-branding. And as WCHP are unwilling to disclose you can decide your own estimate. Case studies, white papers, customer testimonials, etc. Update your listings in applicable online directories. Only John Holmstrom of WCHP could have the front to imply that an increase in rough sleeping is an indicator that the charity is succeeding. Rough sleeping is not like Domestic Violence, where an increase in reports does not necessarily indicate an increase in frequency. Rough sleepers are quite literally out in the open. The quotes below are taken from comments made to the Worthing Herald (Worthing Herald Article). Here is what Centrepoint a leading Homeless Charity has to say about Zero Hour Contracts and their link to homelessness. Zero-hours contracts are trapping young people in homelessness, a leading charity has warned. Centrepoint has told The Independent that the controversial but increasingly common contracts are making it harder for 16 to 25-year-olds to escape homelessness and more likely for them to be saddled with rent arrears leading them being evicted. Many people will be aware of ReRide, a project that not only generated income, but helped recycle unwanted bicycles, provided affordable bikes to the community, and more importantly help with client rehabilitation. ‘ReRide is just the sort of project that Worthing Community Chest is looking to support’ Worthing Community Chest Trustee, Fred Weller commented ‘By providing re-skilling across the age and social spectrum it adds so much to the self confidence and personal worth of those who take part. In doing so it cannot help but contribute to the wellbeing of the wider community in Worthing. And the end products, the bikes that are re-constructed and put up for sale are brilliant! A tremendous reflection on the work and commitment of everyone involved. Not only does the project give WCHP clients a sense of worth and the opportunity to give something back it provides training, qualification and a stepping stone back to the full working environment as well as a lot of fun. The quality restored bikes themselves play their part as most are sold to people on lower incomes to enable them to get to and from work or to improve their general health and wellbeing. From my Previous Blog Post you will see my disappointment at the closure of ReRide, which I believe significantly contributed to the death of a WCHP client. As you can see from the quote below from WCHP’s own end of year statement the project was not considered financially viable. I know this to be untrue, however I am unable to publish the evidence, so you can believe me or not. Also see the comments from Beth Dismore in the link above, again one individual has questioned the accuracy of Beth Dismore’s statement, so you will have to decide for yourselves. So I’m not sure how much money would have been required to keep this “absolutely fantastic project” going? What value do you put on transforming the lives of clients, rather than placing them in a hostel and raking in the benefits?